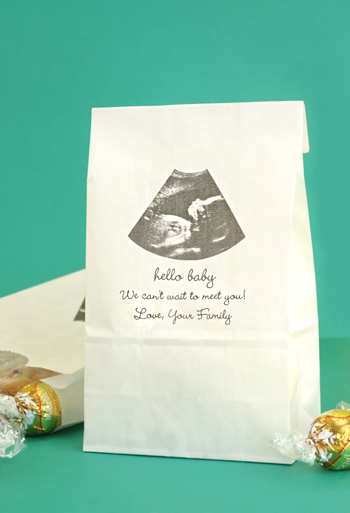 Show off your favorite maternity photo or ultrasound photo with these personalized photo baby shower goodie bags. The perfect size for filling with homemade treats for guests, these bags measure 4 x 2 x 8 inches. We describe these paper bags as miniature versions of a standard paper lunch bag and are available in assorted color options. All photos and personalization are digitally printed on the front of the bag in black ink only.